Are you looking to expand your family, but worried about how another baby could affect your ability to pay the bills on time? Do you have a limited amount of free time, but are in need of a little financial boost to help finance a much-needed vacation? With Kaeser & Blair’s at home business opportunities, you could improve your family’s financial security while still maintaining your previous work and family commitments. Kaeser & Blair knows that you work hard to maintain your way of life. Your family is important to you, but sometimes financial pressures can distract from spending time with the kids. This can lead to a lot of stress, especially with another little one on the way and minimal time as is. With Kaeser & Blair’s at home business opportunities, you work whenever is convenient from you, right from the comfort of your own home. That way, you get to spend more time with the people who matter most to you and less time worrying about finances. Becoming a Kaeser & Blair business owner is an easy process: simply purchase the Standard Business Owner Package for $85 and immediately begin selling. It’s that simple! You get to be in charge of everything: when, where, and how often you work. If you choose to keep your old job and simply tack us on wherever you can, that’s just fine. Unlike other at home business opportunities, K&B allows you to maintain multiple jobs and obligations at the same time. No contract, no hidden fees. Just more time selling. Still unsure? Part-time business owners have the potential to make up to $20,000 a year from selling promotional products, and full-time business owners can make up to $185,000. This isn’t too good to be true, it’s been done by many of our business owners! Making outstanding numbers such as these is achievable by selling from our Best Buys catalog, included in the Standard Business Owner Package - over $100,000 in promotional products are sold every day from this catalog! Our at home business opportunities could give you the money you need to put towards your growing family. Quality family time is important to us at Kaeser & Blair. As your own boss, you would be completely in charge of your own schedule. Whether you have time to work five days a week or one, we’ll support you no matter what. 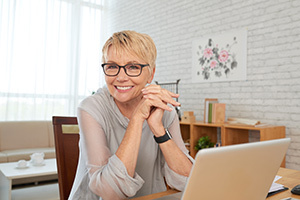 Our at home business opportunities provide the flexibility you need while offering you the opportunity to help support your family financially. If your schedule is tight, bills are coming in, and you need a boost of extra cash, get started with Kaeser & Blair’s at home business opportunities. Request a FREE TRIAL LAUNCH PACKAGE and see how much you could be making today!